I was unfortunate enough to be recruited by Dragon Recruiters (Kaohsiung based racket) on coming to Taiwan, but I was equally fortunate to land a good first boss. That was no thanks to DR, just blind luck. While still in The Republic, DR head boy, Steven, sent me a file filled with "info" about Taiwan and teaching here. I can't say it was very helpful and it was filled with bile about Taiwan and, the first indicator that I would be perceived as less than adequate, that SA English teachers aren't as highly regarded as we might like. His case was built around the "fact" that SA is a little country and that not much is known about it in Taiwan. This may be true, and in fact the popular opinion is that SA is populated by animals and backwards natives running around in skins. This opinion is a generalisation, but the idea is relatively spot on concerning how SA is perceived. Why You Should Not Hire South Africans To Teach In Your School. I am Frank, of HIGHER STANDARDS TAIWAN ASSOCIATION. 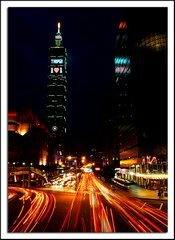 We are a new, but fast growing group, made up of highly educated people of both Taiwan and Foreign membership. We are a think-tank organization dedicated to improving all areas of life in Taiwan. Recently, there has been growing concern among the general public over the large number of South Africans teaching in our schools. This is not a good thing for two very important reasons. Firstly, South Africans are not native speakers of English. Most South Africans speak the AFRIKAANS language which is a mongrel form of the Dutch language...Their accent is absolutely terrible and most North Americans say they have tremendous difficulty in understanding the South Africans...Our children in Taiwan are learning a form of English which is absolutely unacceptable to real English speaking people. Also, these Afrikaaners have absolutely no grammer skills. It is at the level of a grade six elementary school child in a real English speaking country. Why do you hire these people considering there are many top Taiwanese students graduating from our universities with better accents than the Africaaners and far superior skills in grammer. Is it because the Africaaners have a white face? There are many students from our universities here in Taiwan, with majors in English, unable to find an English teaching poisition because the South Africans are crawling all over the Island begging for jobs. No, your first choice for a good English teacher must be one with a North American accent, either from the United States of America or Canada. The economic and military power of North America dictates the world and their language also dictates the world. Your second choice for teachers must be those from Britain, New Zealand and Australia. You must try to get real teachers. The second reason for not hiring a South African deals with culture and apartheid. Apartheid is a very offensive policy to any civilized man. In short, it states that all colored races are inferior or lower than the white man and, therefore, they must live separately. The Chinese people were considered colored, under Apartheid, and not allowed to mix with the Africaaners...Yet these same South Africans are here teaching your children. Because of decades of Aparthied, the South Africans became extremely dishonest, cunning, devious, not to be trusted. In front of you, they are so honest, so kind, so generous, so considerate, but this is just a cover, they are merely sucking for their jobs. All South Africans in Taiwan declare they never supported Aparthied, but by the very fact that they ran away from South Africa proves that they did support Aparthied and they are now on the run. They are afraid to live in South Africa because the black people are hunting them down for their activities during the years of Aparthied. Already, in Taiwan there are stories going around of a South African MAFIA. Most South Africans are not of good character despite their wonderfully friendly exterior. We strongly advice you not to renew contracts with South African teachers and not to hire any more. Why should parents pay such high tuition fees to a school for a third rate South African teacher that can barely speak proper English. This is the very first step towards solving this Africaaner problem here in Taiwan. We will follow this up aggressively. I think any person in a foreign country reading something like this would feel less than welcome and not entirely thrilled. However, the originator of this gem calls himself Frank Alexander, which is definitely not a Taiwanese name. Once you get away from the venom, this is actually an interesting article. With a name like Frank Alexander, this laddie is surely a foreigner (unless he is a Taiwanese posing as one). What makes the article interesting is his abysmal English and poor grammar (kinda like a sixth grader, right?) whilst all the while raging against allegedly bad South African (and particularly, Afrikaner) grammar and English usage. Additionally, if Frank A is in fact a Taiwanese posing as a foreigner, what of his other position? That of the superior language abilities of Taiwanese graduates? Anyone who has taught here for any amount of time will surely know that graduating from a Taiwanese Uni (or indeed, even passing the GEPT or TOEIC examinations) hardly guarantees any form of linguistic ability. Unfortunately too much is made of passing tests and writing ability, and almost no attention is given to actual listening and speaking ability. If Frank is indeed a poser (as I suspect the moron was), his argument is self defeating. *edit* That is not to say that I haven't met many Taiwanese with good to excellent English language abilities. However, the majority of them aren't language teachers and cash in on this ability in other professional capacities. Although, I should say, at the time I didn't find anything funny in it.